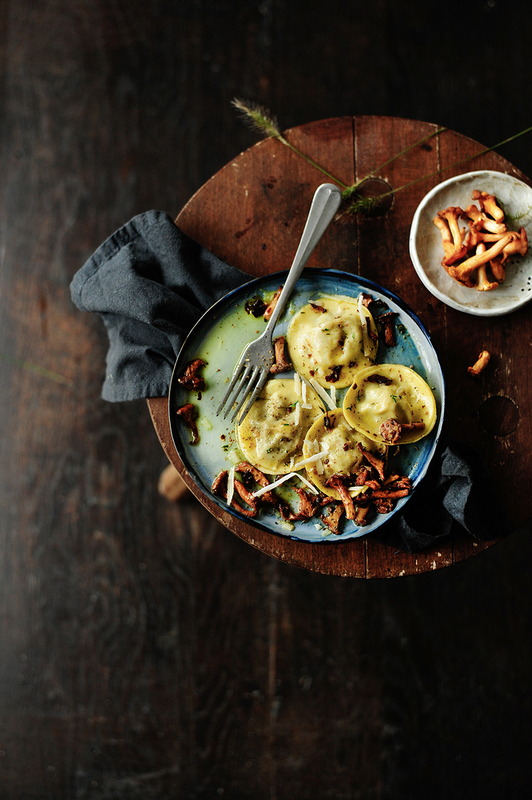 These ravioli are the perfect comfort food for autumn evenings, filled with pulled chicken and lots of mushrooms. The pulled chicken would probably be enough to make an incredibly tasty filling, but I added porcini which I found on a forest walk and they made the filling irresistible. For the sauce I sautéed the chanterelles and made them luscious with a full conviction of butter, thyme and plenty of garlic. A scrumptious dish at its best. In a dutch oven or a heavy pot add the chicken fillets with spices and garlic, pour the broth and cover with lid or aluminum foil. Bake for 90 minutes at 160°C. Remove from the oven, allow to cool (covered), then transfer the chicken to a large bowl. Use two forks to shred the chicken finely. Put the flour, eggs, oil, and salt in the bowl of your food processor and turn 5 minutes at medium speed. Remove the dough and knead by hand for 2 minutes. Cover and set aside for 30 minutes. Heat the oil in a skillet, cook the porcini, add shallots and garlic. Cook for 3 minutes, season with salt and pepper. Transfer into the bowl of your food processor, add parmesan and pulse. Combine with the pulled chicken. Place scoops of filling onto a pasta dough sheet. Brush the dough with water around the scoops of filling. Place a second sheet on top, making sure that there is no air in the pockets. Use a glass to cut the ravioli out and stick the edges together. Cook in salted water for about 3-5 minutes. Remove with a slotted spoon. Heat the oil in a skillet, sear the chanterelles until browned, add garlic and cook for 2 minutes. Add butter and season with salt, pepper, lemon juice and thyme. Enjoy! Stunning and absolutely delicious looking. Such tasty flavours. Thank you! So happy you like it Cat! I am really inspired to make these. Such gorgeous flavours accompanied by stunning photos! I adore pasta and don’t make it from scratch enough. Feeling very inspired now. 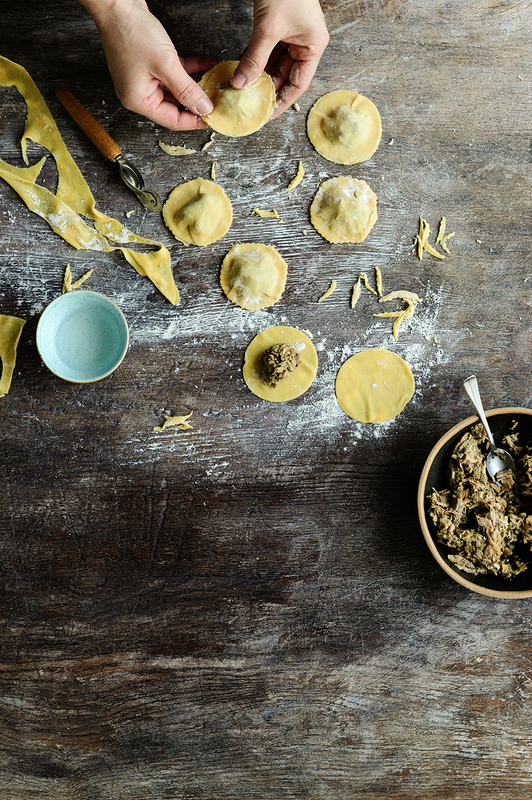 Can’t wait to get home and warm up over a big bowl of homemade ravioli! This looks so delicious and warming – perfect comfort food!